In June, the ECB announced it was likely to end its net asset purchase programme in December and that it expected to keep interest rates at their present level ‘at least through the summer of 2019‘ , albeit with a caveat relating to inflation developments remaining in line with the Banks expectation of a steady convergence to target. Some confusion ensued as to when the summer actually ends but the ECB has since indicated it is happy enough with market expectations of a rate rise at the September or October meetings next year. Any change is more likely to initially involve the ECB’s Deposit rate rather than the Refinancing rate, and the latter is more significant for existing Irish mortgage holders as Tracker rates account for over 40% of the stock of mortgage loans.However, it would then only be a short period of time before a rise in the refinancing rate occurred if the ECB was set to embark on monetary tightening. Why has the Governing Council decided to signal a probable rate rise? In part because the EA economy performed strongly in the latter part of 2017 and although growth moderated in the first half of this year, to 0.4% per quarter, that is still above what the Bank considers to be potential, which has resulted in further falls in the unemployment rate. The ECB is also more confident that wages are finally responding to the tighter labour market, and as a result expects underlying inflation to pick up steadily , with the ex food and energy measure forecast to average 1.8% in 2020 from 1.1% this year. As such , the Council is more confident of a ‘sustained convergence’ in headline inflation to target. In fact headline inflation has been above target for the past four months, oscillating between 2% and 2.1%, boosted by higher energy prices. Yet that is also squeezing household incomes ( wage growth was 1.9% in q2) and core inflation ( which excludes food , energy, alcohol and tobacco ) has remained stubbornly at 1.1% or below in recent months, slipping back to 0.9% in September. The economic outlook also looks less robust than it did. The ECB maintains that the risks to EA growth are balanced but at their September meeting it was noted that a case could be made that the risks had tilted to the downside. Since then , the global outlook certainly seems to have deteriorated amid a backdrop of falling equity markets, rising trade tensions, weaker growth in China, a rising dollar, Brexit uncertainties and Italy’s apparent willingness to breach euro fiscal rules. Indeed, some of the hard data in the EA has been noticeably weaker over the summer months and the PMIs have also softened, with the latest reading for the EA as a whole dropping to a 2-year low of 52.7 in October, That is consistent with GDP growth of only 0.2% a quarter and it will be interesting to see whether the ECB reiterates its balanced risk view at the upcoming meeting. It may be that the current weakness in sentiment and activity proves temporary but what may also concern the ECB is that more forward looking indicators also signal weakness ahead. The major European equity indices are all heavily in the red year to date while monetary indicators are not reassuring; M3 growth has slowed to 3.5% while the growth rate of lending to the private sector has remained becalmed at 3.4% in recent months, with mortgage lending slowing a little to 3.2%. It is unlikely that the ECB will do a volte- face on its forward guidance at this juncture but the risks to their view on inflation have risen and it is not a done deal that rates will rise in 2019. In July, Permanent tsb sold a portfolio of around 10,700 residential mortgages. According to the bank 2,500 of these borowers were not co-operating and a further 3,850 had failed or refused treatment, which raisies the issue of strategic defaulters or debtors who won’t pay as opposed to being unable to pay. How big is this cohort and how significant are they in the context of Irish arrears? Mortgage arrears in Ireland are extraordinarily high by international standards but have been falling steadily for some time now. 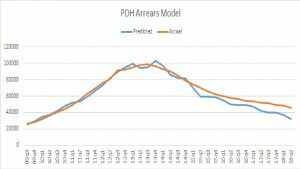 The number of PDH loans in arrears for over 90 days peaked at just shy of 100,000 five years ago, equivalent to 12.9% of outstanding PDH mortgages, and according to the Central Bank the latest figure, for q2 2018, was 46,000 or 6.3%. What determines arrears? 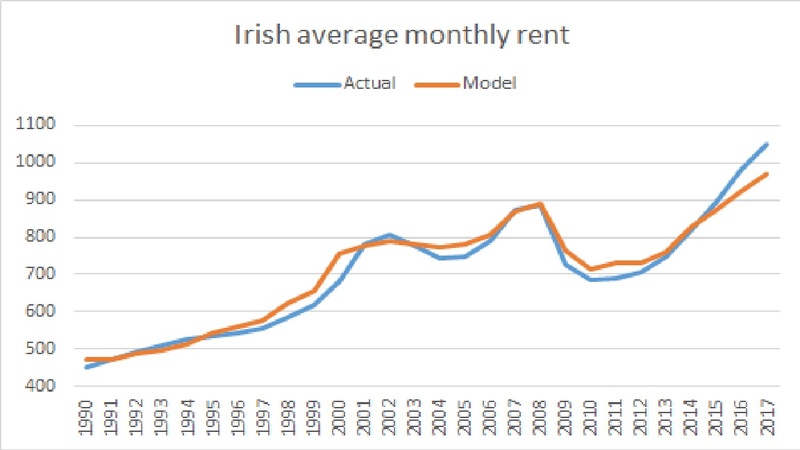 We have developed a model in which PDH arrears are positively related to unemployment (affecting the borrowers income) and the mortgage rate (over 80% of Irish mortgages are on a variable rate) and negatively affected by the trend in house prices, which presumably is picking up an equity affect. The chart illustrates the model results and the actual level of arrears. Rising unemployment and falling house prices combined to drive arrears higher from 2009 onwards before reversing course as the labour market improved and house prices began to recover. 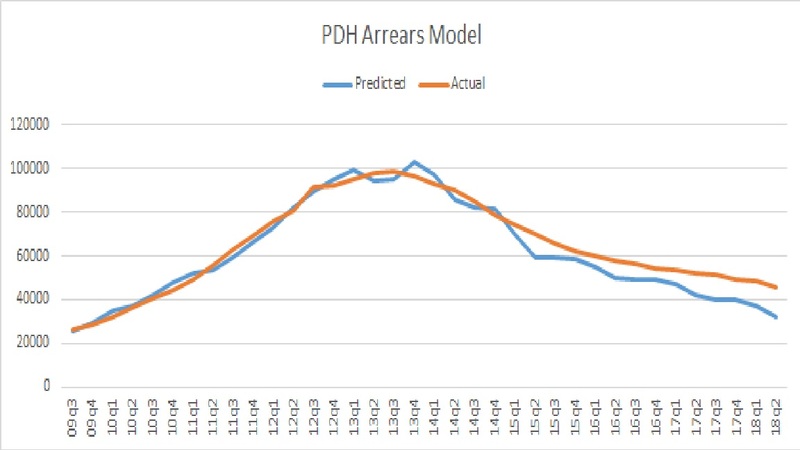 Those factors are still in place and so the model is continuing to predict lower arrears, although it is also clear that over the past few years there is a systematic error , in that arrears are running consistently higher than the above fundamentals imply. Of course mortgage loans are secured and the level of arrears will be affected by the number of repossessions , which are also extremely low in Ireland relative to the level of non-performing loans. In fact PDH repossessions are falling and those stemming from a court order (as opposed to a voluntray surrender) peaked three years ago, declining to an annual 439 in q2 from well over 700 in 2015. Our model predicts an arrears figure of 32,000 for q2 this year, which is 14,000 below the actual outurn. The implication is that arrears should be falling faster given what is an extremely favourable economic backdrop, implying a more intractable problem and also picking up some degree of strategic defaulters. Full Employment in Ireland-are we there yet? The Irish unemployment rate fell to a fresh cycle low of 5.1% in June, from 5.6% in March and 6.6% a year earlier. The monthly estimate is subject to revision but on the face of it implies that employment growth has accelerated from an already strong pace and that Ireland is approaching full employment. The speed of the decline has certainly surprised most analysts; the Department of Finance anticipated unemployment bottoming out next year at 5.3% from an average 5.8% in 2018. In fact, Government budgetary projections are predicated on the view that the economy is already operating above is potential, although one rarely hears that articulated by Ministers. Full employment does not mean a zero unemployment rate; there will always be churn in the labour market (frictional unemployment) and some workers may not have the skills, education or aptitude to take up the available jobs (structural unemployment). The scale of the latter, in particualr, is hard to gauge so estimates of what unemployment rate is consistent with full employment often vary and can change over time; the unemployment rate has surprised to the downside of late in both the US and the UK, for example. Ireland has also experienced lower unemployment in the past, with a rate under 4% in the early noughties and a sub 5% reading in the years before the 2008 crash. That perhaps argues that the unemployment rate could certainly fall further, and particularly as the participation rate ( that proportion of the population over 15 in the labour force) is still much lower than it was a decade ago, averaging 62% over the past year as against well over 66% in 2007. A return to the latter level would equate to an additional 170,000 joining the labour force, equivalent to three years employment growth given the current pace of job gains. That kind of a move in the participation rate seems highly unlikely, however, given the modest level of net immigration currently seen relative to the pre-crash period. Nonetheless, the pool of available labour is bigger than captured in the labour force data, as the figures also record those who are seeking work , but not immediately, as well as those available for work but not yet seeking it. The CSO defines these two groups as the Potential Additional Labour Force (PALF) and this figure is sizeable, amounting to 120,000 in the first quarter. The unemployment rate adjusted for the PALF is therefore much higher, at 10%, although it is problematical to compare this with the historical experience as there was a step jump following the switch to a new survey methodology in the latter part of 2017. Employment is now marginally above the pre-crash peak and if labour is getting scarcer one might expect to see an acceleration in wage growth as firms bid for workers. That has not been evident, however, at least as yet. Average weekly earnings in the private sector rose by an annual 1.8% in the first quarter of 2018 following a 1.7% rise in 2017, but that followed a 2.3% increase in 2016. Low consumer price inflation may be a factor but wage inflation is surprisingly soft in some areas where there is perceived to be a scarcity premium, notably construction, with average earnings growth of 1.1 % in the first quarter and only 0.3% last year. It is also worth noting that although total employment is again around the pre-crash peak the composition is more evenly distributed across sectors. Then, 10.5% of jobs were in construction alone but that proportion in 2018 is only 6%, with the total employed some 100,000 below the peak. Employment in industry too is 20,000 below the pre-crash level and also lower in retail (36,000) and financial services (4,000) Indeed, although some private sector areas have seen job gains, notably Hotels and Restaurants (30,000 ) and Professional and Scientific (12,000), most of the increase has occurred in areas dominatd by the public sector, including Education (30,000) and Health (40,000). Ultimately, the clearest sign that the economy has reached full employment is when the unemployment rate stops falling and that is only observed ex-post. However, the current distribution of employment, the absence of aggregate pay pressure and the relatively low participation rate all point to the likelihood of unemployment falling further in the absence of a demand shock. The latter is always a risk, of course, be it from Brexit or from a broader global slowdown. Irish consumer sentiment, as captured by the KBC/ESRI monthly index, reached a record high early in 2016 before slipping back later that year.It has picked up again in recent months and is now close to the previous peak. Households would therefore seem to feel good about the economy and their own financial situation and an alternative measure, the Misery Index, tells a similar story. That is simply the sum of the unemployment rate and the inflation rate, two readily available monthly indicators that are likely to have a strong impact on the average household. The index fell to around 6 in 2004, reflecting an unemployment rate of 4.5%, and soared to a high of 18 in 2011 amid a collapse in employment. The steady fall in unemployment in recent years has been the main driver of the decline in the index, which fell to an all-time low in June of 5.7%, with inflation at -0.4% and unemployment at 6.1%.The latter has fallen further, to 6.0%, but inflation has turned modestly positive so the index is now rising again, albeit still at 6.3%. The Misery index has probably bottomed in this cycle, however, given the likely trend from here in inflation and unemployment. The latter may find it difficult to fall much further as the recent data implies we are at or near full employment; it has taken five months for the unemployment rate to fall from 6.2% to 6.0%. Inflation may well see the sharpest change. Falling energy prices and lower mortgage rates were big factors in dampening the CPI over the past three years but energy costs have now started to rise again on an annual basis and mortgage costs are now unchanged on a year earlier. The euro’s appreciation against Sterling has proved a significant counterweight over the past year, reducing the price of imported goods, notably food, but that will not be repeated absent another lurch down in the UK exchange rate. Consequently, we may well have already seem the low of the cycle in the Misery index, although the increase may well be at a modest pace. UK housing market ; short term blip or steeper fall in prospect? The UK economy defied the consensus expectation of a slowdown last year following the Brexit vote, and fears for the housing market were not realised. The last few months have reignited concerns about both, however, and the news that the Bank of England is now split on whether to raise interest rates ( a 5-3 vote to maintain the status quo) won’t help. House prices have certainly cooled. The Nationwide index for May showed annual house price inflation at 2.1%, the softest pace in four years, with a clear slowing trend; the index has now fallen for three consecutive months, by a total of 0.9%. The picture from the Halifax index is similar, with annual inflation slowing to 3.3% in May, from 6.5% in December. Both indices are based on mortgage lending and the Office for National Statistics (ONS) publishes a broader but less timely measure, based on Land Registry transactions, which shows an annual rise of 5.6% for April, albeit also pointing to a slowing trend. The RICS data, based on a survey of chartered surveyers operating in the residential market. also reveals a softer market. with a net 17% of respondents in May expecting prices to rise, the weakest reading since the summer of 2016. Buyer and seller inquiries were also seen to have cooled. Are UK house prices excessive? The average price in the UK is now £209,000 according to the Nationwide, or 48% above the cycle low in early 2009. Prices are also now well above the previous peak ( £186,000) and are 5.3 times the income of First Time Buyers (FTB) against a long run average of 3.6. However, interest rates are unusually low; the standard variable rate is over 4% but the effective rate on new mortgages is around 2% according to the BoE, reflecting discounts and lower fixed rates. Consequently , affordability measures do not suggest prices are overvalued; the Nationwide data, for example, shows mortgage payments at 33% of FTB income, bang in line with the long run average. Indeed, for most of the UK regions affordability is much better than the norm, the exception being London, although non-resident purchasers are more significant in that market. The supply of housing in the UK is widely thought to be persistently short of the demographic requirement, but completions also fell sharply after the crash, declining to 107,000 in England ( which has the most timely data) from 170,000 in 2007. Completions have picked up again, in response to higher prices, rising to over 140,000 in England in 2016, and the housing starts data points to a higher total again this year. Yet few argue that supply is still anywhere near demand. Net mortgage lending has been growing, in contrast to Ireland, although at a modest pace relative to historical exerience, but now also appears to be slowing, with annual growth at 2.8% in April against over 3% for most of the past year. Mortgage approvals for house purchase, a more forward looking indicator, fell below 65,000 for the first time in six months in April. This all may relate to uncertainty about Brexit and the short term economic outlook, with the election result also likely to weigh on sentiment. In our view the likelihood of a more prolonged and sustained period of weakness depends upon the labour market, which to date has held up remarkably well; the employment ratio is at an all-time high, while unemployment is still making new cycle lows. One suspects that UK lenders and the Government would only become seriously concerned about the housing market if cracks started to appear in employment. It is a curious fact that following any rate change by the ECB the headlines in Ireland always focus on the impact for mortgage holders. Curious , because there will also be an impact on deposit rates and there are far more savers than borrowers. Indeed, that is now also true for the the sums of money involved; Irish household deposits in the Irish banking sector amounted to €97bn in December, against €88bn in loans to Irish households, a divergence that began to open up from last July. About three -quarters of these deposits are defined as ‘overnight deposits’ and the interest rate is just 0.12%. This is a gross figure, and the DIRT rate payable is currently 39% , reduced from 41%, so savers only receive 0.07% i.e. next to nothing. Rates are historically low across the developed world, of course, but the Government is adding to the squeeze on savers, leaving aside the DIRT issue; the Bank Levy, which raises €150m a year from Irish banks, is based on the amount of DIRT collected by each institution, and as such provides a disincentive for banks to pay for deposits, particularly as the overall loan to deposit ratio for Irish headquartered banks has been below 100% for some months now. Banks can also access four-year cash from the ECB at a zero interest rate, so have even less reason to seek out deposits. A Levy based on bank profits might have a less distortionate effect on the savings market. At its core the banking system merely transfers money from savers to borrowers, with the margin received for this intermediation dependent on the degree of competition in the market. That relationship is often forgotten , with so much emphasis on borrowers, an emphasis not readily observable in other countries. The widely accepted view on the Great Depression is that it was exacerbated by a series of policy errors- trade protectionism, tight monetary policy and contractionary fiscal policy. Consequently, given the lessons learned, the Great Recession in 2008-9 prompted a substantial policy reaction across the globe, with a massive easing in monetary policy accompanied by counter cyclical fiscal policy. Oddly, though, policy makers then decided that debt reduction should take priority, and fiscal policy generally became contractionary even when the global recovery began to falter and lose momentum, with monetary policy seen as ‘the only game in town’. That emphasis on the perceived dangers of high and rising sovereign debt resulted in new and stricter fiscal rules in the Euro Area (EA), emphasising the need for a steady and persistent reduction in budget deficits. Policy doubts eventually began to emerge, including from the IMF, with evidence questioning whether ‘austerity’ actually reduced debt levels and claiming that the negative multiplier effects of contractionary fiscal policy were steeper than previously believed. Doubts also grew about the effectiveness (and possible adverse consequences ) of loose monetary policy particularly after the adoption of negative interest rates and large scale QE. The ECB has also changed its tone of late, accepting the need for monetary policy to be complemented by some expansionary fiscal policy in the EA, albeit while still respecting the existing fiscal rules. Academic debates on fiscal policy have also intensified, with the case being made that budgetary policy can be more effective at or around the zero rate lower bound, but events have transpired to take fiscal policy centre stage in the real world. The UK government has already announced , post the Brexit vote, that it has abandoned its previous pledge to balance the budget by 2020, and is expected to announce a more expansionary fiscal path later this month. In the US, markets now expect fiscal policy to be far more expansionary under the incoming Trump Administration, although it remains to be seen how much of the campaign rhetoric will translate into policy action. Closer to home, the European Commission has just announced , for the first time, a recommendation on the overall fiscal stance in the EA, and is advocating that it should be expansionary in the coming year, amounting to 0.5% of GDP , equivalent to a €50bn budgetary injection. On existing national plans , the overall EA fiscal stance is expected to be neutral in 2017, after being modestly expansionary in 2016, and the Commission believe that a number of countries have the fiscal space available to raise spending and/or cut taxation, although it cannot force any action. The group comprises Germany, Estonia. Malta, Latvia, Luxembourg and the Netherlands. In practice, the Federal Republic is the only member with the size to affect the EA as a whole, and while calls for Germany to adopt a more expansionist policy in the interests of the wider zone have been made before, it is novel and perhaps surprising to see Brussels join in that chorus. The Irish Economy has some serious Capacity Issues. The Irish recession was long and extremely steep but it ended over six years ago and the economy is now growing rapidly; real GDP has risen by 25% from the cycle low and is now over 10% above the previous peak. Indeed, according to the Department of Finance, Ireland is now operating above full capacity. Others, including the ESRI and the Irish Fiscal Advisory Council have queried this but all agree that the degree of spare capacity in the aggregate has diminished. It is also true that one does not have to look hard to observe capacity issues in specific sectors of the economy, particularly in and around the capital. Take tourism, which is booming; last year the number of visitors to Ireland exceeded 8.6mn, having grown by 13.7%, and on the evidence of the first quarter the figure for 2016 will exceed 9.5mn. That has put pressure on accommodation, and the price of a hotel room rose by over 5% in May alone and is 9% up on the previous year. One could not give a hotel away not so long ago but now rooms are scarce and are 22% more expensive than in 2012. Housing in general is also scarce , of course, particularly in Dublin. 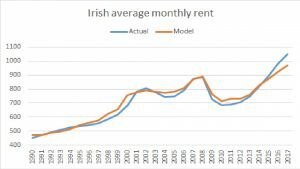 Rents, nationally, are at record highs and on the CSO data there is no evidence of any significant change in trend, with the latest figure for May showing a 9.7% annual rise. Irish residents are taking more foreign trips too ( up an annual 13% in the first quarter of 2016) and it is not surprising that Dublin Airport is now seeing record passenger numbers, with 2.5mn in May alone , an 11% rise on the previous year, implying the 2016 figure will be well in excess of last year’s 25 million. The Airport is building a new runway to help cater for the increased demand, and it is instructive that the planning permission was initially granted in 2007 and then put on hold. Car ownership is also growing strongly again, with sales up 31% last year following a 29% increase in 2014. The latest data for this year points to a 25% rise which would take the annual figure to over 150k for the first time since 2007. Hardly surprising then that record numbers are using the M50, with gridlock at peak times not uncommon. The growth in the population as a whole is also putting pressure on schools and hospitals, although one could be forgiven for thinking the population is falling given some media coverage of emigration. The reality is that the population surged by over half a million in the six years to 2009, reaching 4.53mn, and by 2015 had risen to 4.64mn, as net migration has slowed to virtually zero and is anyway offset by the natural increase. The conclusion has to be that Ireland needs to embark on a huge programme of capital investment in order to tackle capacity issues, particularly in and around Dublin. Borrowing costs for both corporates and Governments are at historically low levels and there has been some increase in building, both residential and commercial, although the former is still well below the annual demand, so exacerbating the existing supply/demand imbalance. Unfortunately it is a mark of the absurdity of the current fiscal rules imposed on euro members that capital spending by the State is not excluded from the expenditure constraint ( only some incremental spending is allowed) and so any amelioration in these capacity issues is unlikely to occur any time soon.